How can we serve up poetry in a fresh new way? This is the question we ask ourselves each time we start a project. 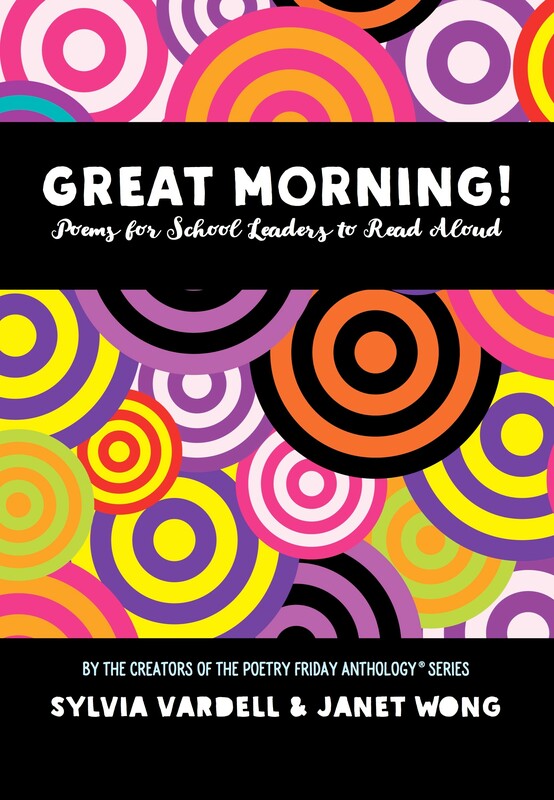 In our early books in The Poetry Friday Anthology series, we provided a “Take 5” approach that emphasized participatory readings and skill connections; in the Poetry Friday Power Book series, we aimed to engage students with prewriting activities and writing prompts; and in our newest book, Great Morning! 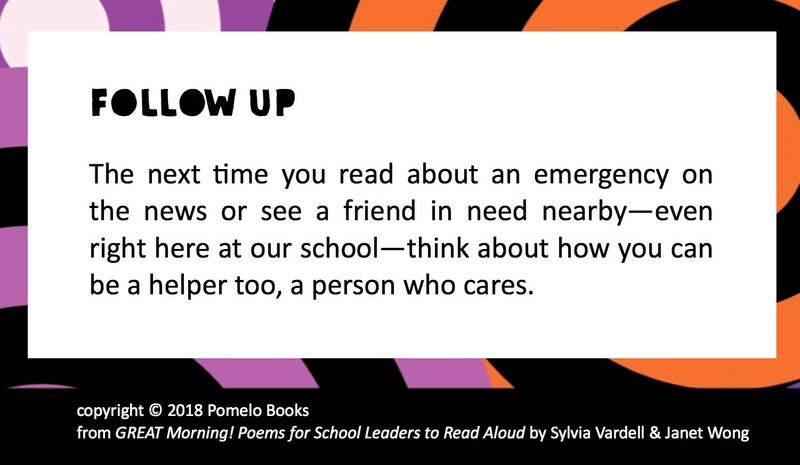 Poems for School Leaders, we take yet another approach, trying to make poems easy to share, bite by bite, by principals (or students and guest readers) during morning announcements, with connections made by teachers and librarians later in the week. In GREAT Morning! we provide 75 poems with ready-to-read introductions and follow-up paragraphs—a mix of new poems and previously published exemplars from The Poetry Friday Anthology series. Here is “Look for the Helpers” by Michelle Heidenrich Barnes, which focuses on how we can all help one another and build a sense of community. A brief “Did You Know?” introduction sets the stage for the poem. Reading this “Follow Up” closing (after the poem) provides a call to action. This exercise in poem-sharing builds community not just through the topics of the poems, but also by giving members of your school community a meaningful and easy-to-implement opportunity to have their voices heard and provide a shared moment for the whole school. In just 37 seconds, we can offer an opportunity for all listeners to pause and ponder a single poem together and nurture the social-emotional culture of the whole campus community. If these poems are our breakfast biscuits, the additional curricular connections that can be made later in the week are the gravy. The back matter of GREAT Morning! 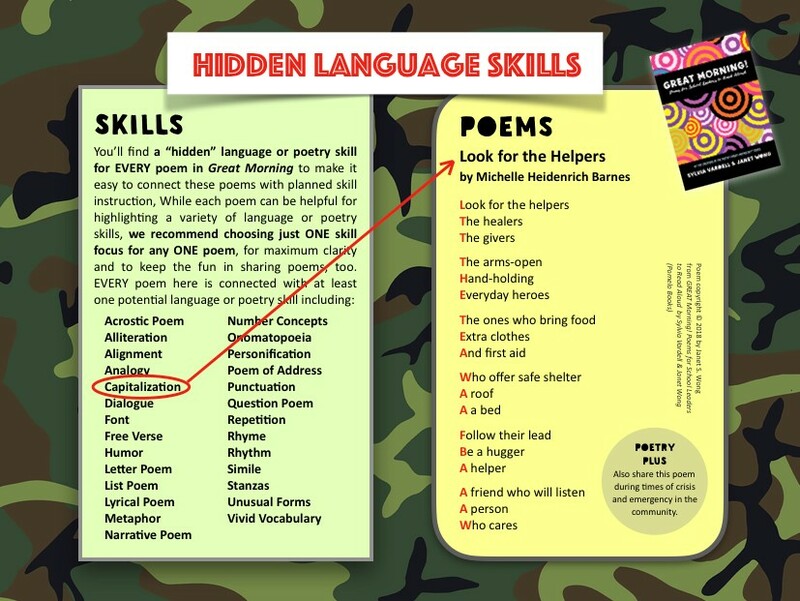 contains “Hidden Language Skills” (p. 139) that point out tidbits of language arts learning. In the case of “Look for the Helpers,” we note that sometimes poets capitalize the first letter in each line. For “If You See Something, Say Something,” the Hidden Language Skills entry highlights the poem’s use of dialogue. 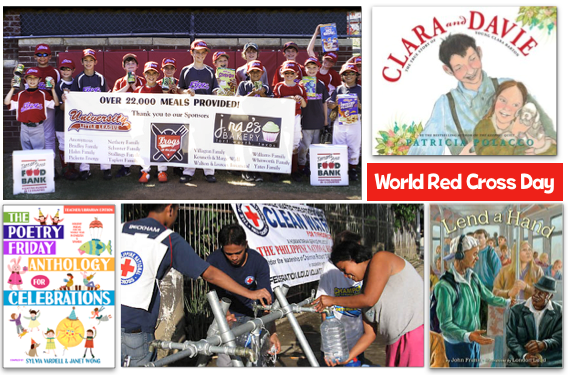 “Look for the Helpers” is an exemplar poem that first appeared in The Poetry Friday Anthology for Celebrations and was linked to World Red Cross Day celebrated every May. In the accompanying Take 5! instructional activities there, we recommended an approach that can be used effectively by teachers and librarians in many instances, linking poetry and picture books. Set the stage by asking children if they have ever experienced help in an emergency or seen it depicted on TV. Then read this poem aloud slowly. Share the poem again and invite children to chime in on the important last two lines (A person / Who cares) as you read the whole poem aloud. Talk about what the Red Cross does (help people during emergencies). A helpful resource is IFRC.org. 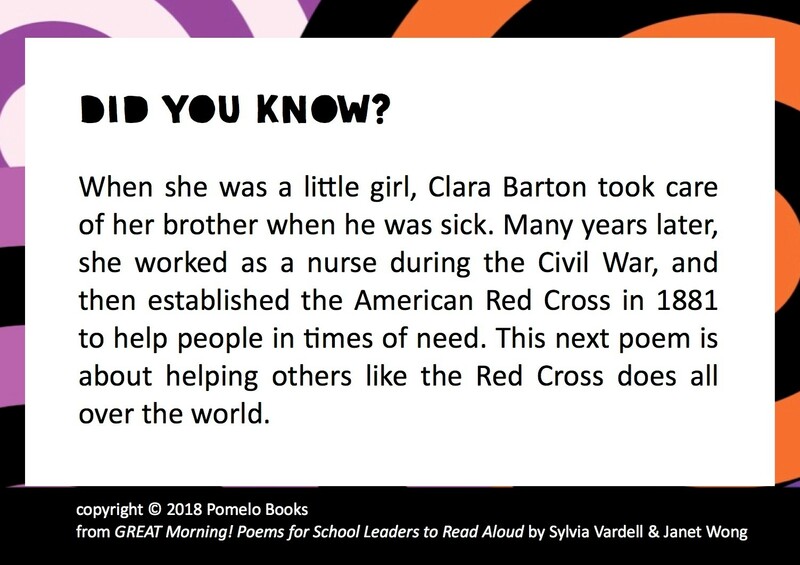 Pair this poem with the picture book Clara and Davie by Patricia Polacco (Scholastic, 2014), which is about American Red Cross founder Clara Barton and the brother who helped her realize her “gift for healing.” Then brainstorm ways that children can be helpers and healers. Link with another poem about helping, “Box for the Thrift Shop” by April Halprin Wayland (pages 224-225), and with poem selections from Lend a Hand by John Frank (Lee & Low, 2014). You can find this poem featured with yet another curricular approach in Here We Go: A Poetry Friday Power Book, a book designed to promote poetry response and writing. 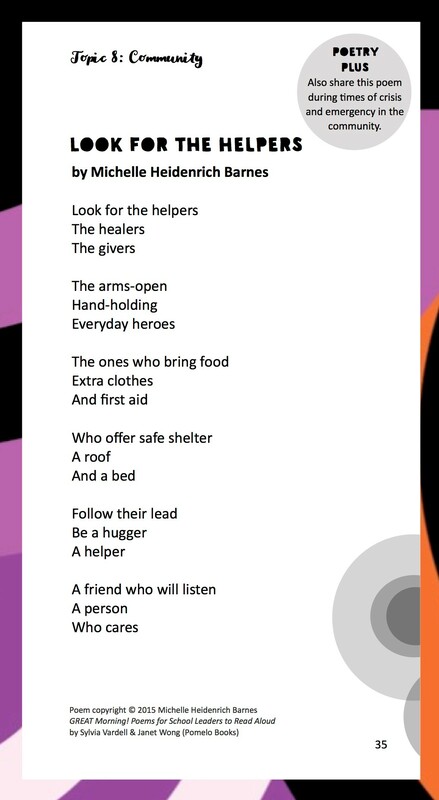 “Look for the Helpers” is the anchor poem in PowerPack 8, introduced with a prewriting activity and then tied to two other poems plus a writing prompt. 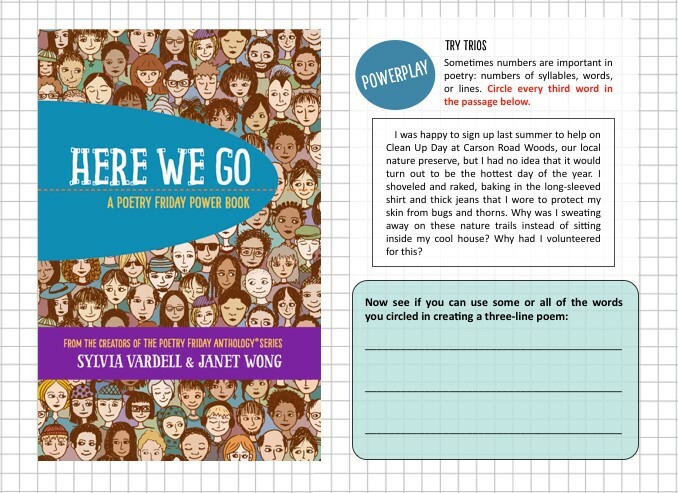 The focus of that PowerPack is showing students how poets can use three-line triplets to build a poem—and guiding them in trying that in their own writing. One poem can have many lives and many layers. Using this example of “Look for the Helpers,” we can show how a poem can express deep and powerful feelings, highlight a holiday or special occasion, or be a model of writing (three-line stanzas). We can connect poems to real world events, and even highlight basic language skills such as capitalization. The more poetry we share with students, the more examples we provide of how powerful, versatile, and expressive language can be! Sylvia M. Vardell is Professor in the School of Library and Information Studies at Texas Woman’s University and teaches graduate courses in children’s and young adult literature. Her current work focuses on poetry for children, including a regular blog, PoetryforChildren.Blogspot.com. Janet Wong (janetwong.com) is the author of more than 30 books for children and teens on a wide variety of subjects, including writing and revision, diversity and community, and yoga. Her current focus is encouraging children to publish their own writing using affordable new technologies. Together, Vardell & Wong are the creative forces behind The Poetry Friday Anthology series and the Poetry Friday Power Book series. You can learn more about their books at PomeloBooks.com. I forwarded this post to my school principals to whom I gave the book. Fingers crossed they use it. Such a wonderful resource and simple to use. If the current generation of students has an affection for poetry, we owe a big debt of gratitude to Wong & Vardell. Their creative publications and deep commitment to making poetry accessible, enjoyable and relevant is inspiring and unmatched. Thank you Sylvia and Janet–for being who you are and for doing what you do!! Thanks so much to Donalyn, Colby, and the Nerdy Book Club Family for hosting us once again. And a big thank you to Margaret and Jen and to our whole poet community for collaborating with us to get more poetry out in the world! We need it more than ever! Big hugs all around! Great post and an excellent resource! My principal gushed her thanks when I dropped off your newest “Great Morning!” While we’re working them into the weekly routine in our elementary school, it has helped elevate poetry experiences school wide.